Is your prosthetic eye hydrophobic? Above, in a hydrophilic surface (left), liquid sheets across. 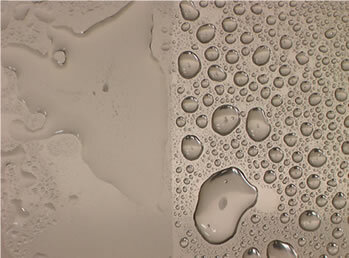 In a hydrophobic surface (right), liquid collects in tight droplets. Do You have a Hydrophobic Prosthetic Eye? In a well-made prosthetic eye, tears should flow evenly across the prosthesis just as they do over the natural eye — in a sheet-like fashion, rather than collecting in droplets. We call this type of behavior hydrophilic — “water loving.” Hydrophobic (“water fearing”) artificial eyes repel water, much like the surface of a waxed car. The difference between a hydrophilic and a hydrophobic piece can have dramatic differences in the satisfaction for the patient. Hydrophobic pieces can lead to feelings of dryness and discomfort, excess mucus secretion, blistering and giant papillary conjunctivitis (GPC). 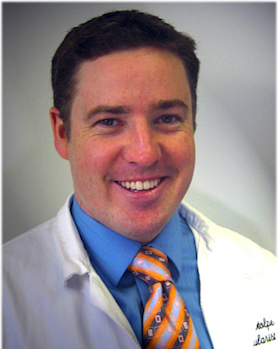 It’s important to note that some of these problems may arise from the patient’s own biology. But often, they arise because of problems that the ocularist creates. The waxes used to polish pieces are sometimes not cleaned off properly and the patient’s prosthesis repels tears. A hydrophobic artificial eye. Notice the water droplets on the person’s right eye. A hydrophilic artificial eye. 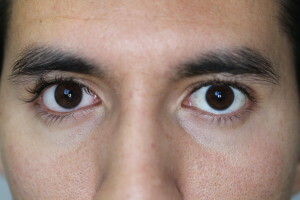 The moisture on the person’s right eye sheets across the surface, as in the left (original) eye. Treating the effects of hydrophobic pieces can be simple, but sometimes the piece may need to be remanufactured. Our office incorporates materials and processes to make our pieces as hydrophilic as possible and remove hydrophobic properties. 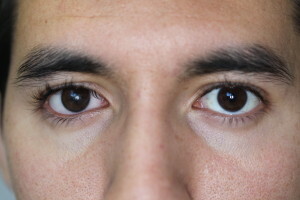 For example, we cure our eyes for long periods, to give the acrylic time to properly polymerize. We also polish our eyes at a low speed rather than going as quickly as we can. And finally we use special cleaners to maximize the integrity of the prosthesis. Chronic problems related to hydrophobic artificial eyes can lead to serious consequences. Please contact us today if you have questions about the hydrophobic and hydrophilic properties of your artificial eye.